Newcastle United Football Club is an English professional association football club based in Newcastle upon Tyne, that plays in the Premier League, the top tier of English football. Newcastle United was founded in 1892 by the merger of Newcastle East End and Newcastle West End, and has played at its current home ground, St James' Park, ever since. The ground was developed into an all-seater stadium in the mid-1990s and has a capacity of 52,354. The club has been a member of the Premier League for all but three years of the competition's history, spending 86 seasons in the top tier as of May 2018, and has never dropped below English football's second tier since joining the Football League in 1893. They have won four League Championship titles, six FA Cups and a Charity Shield, as well as the 1969 Inter-Cities Fairs Cup and the 2006 UEFA Intertoto Cup. Newcastle United has the ninth highest total of trophies won by an English club. The club's most successful period was between 1904 and 1910, when they won an FA Cup and three of their First Division titles. The club were highly successful in the Premier League in the 1990s and early 2000s without winning any trophies, but have been mostly struggling since the 2006–07 season, and were relegated in 2009 and 2016. They returned to the Premier League for the 2017–18 season after winning the Championship title the preceding year. Newcastle has a fierce local rivalry with Sunderland, and the two clubs have engaged in the Tyne–Wear derby since 1898. The club's traditional kit colours are black and white striped shirts, black shorts and black socks. Their traditional crest takes elements of the city coat of arms, which features two grey seahorses. Prior to each home game the team enters the field to "Local Hero", written by Newcastle native Mark Knopfler, while "Blaydon Races" is invariably sung during games. The club has been owned by Mike Ashley since 2007, succeeding long term chairman and owner Sir John Hall. The club is the 17th-highest revenue producing club in the world in terms of annual revenue, generating €169.3 million in 2015. Historically, Newcastle's highest placing was in 1999, when they were the fifth-highest revenue producing football club in the world, and second in England only behind Manchester United. Main article: History of Newcastle United F.C. A chart showing the progress of Newcastle United Football Club from its entry into the League in 1894 to the present. Newcastle have won the league on four occasions. The first record of football being played on Tyneside dates from 3 March 1877 at Elswick Rugby Club. Later that year, Newcastle's first football club, Tyne Association, was formed. The origins of Newcastle United Football Club itself can be traced back to the formation of a football club by the Stanley Cricket Club of Byker in November 1881. This team was renamed Newcastle East End F.C. in October 1882, to avoid confusion with the cricket club in Stanley, County Durham. Rosewood F.C. of Byker merged with Newcastle East End a short time later. In 1886, Newcastle East End moved from Byker to Heaton. In August 1882, Newcastle West End F.C. formed from West End Cricket Club, and in May 1886, the club moved into St James' Park. The two clubs became rivals in the Northern League. In 1889, Newcastle East End became a professional team, before becoming a limited company the following March. However, on the other hand, Newcastle West End were in serious financial trouble and approached East End with a view to a take over. Newcastle West End were eventually dissolved, and a number of their players and backroom staff joined Newcastle East End, effectively merging the two clubs, with Newcastle East End taking over the lease on St James' Park in May 1892. With only one senior club in the city for fans to support, development of the club was much more rapid. Despite being refused entry to the Football League's First Division at the start of the 1892–93 season, they were invited to play in their new Second Division. However, with no big names playing in the Second Division, they turned down the offer and remained in the Northern League, stating "gates would not meet the heavy expenses incurred for travelling". In a bid to start drawing larger crowds, Newcastle East End decided to adopt a new name in recognition of the merger. Suggested names included Newcastle F.C., Newcastle Rangers, Newcastle City and City of Newcastle, but Newcastle United was decided upon on 9 December 1892, to signify the unification of the two teams. The name change was accepted by the Football Association on 22 December, but the club was not legally constituted as Newcastle United Football Club Co. Ltd. until 6 September 1895. At the start of the 1893–94 season, Newcastle United were once again refused entry to the First Division and so joined the Second Division, along with Liverpool and Woolwich Arsenal. They played their first competitive match in the division that September against Woolwich Arsenal, with a score of 2–2. Turnstile numbers were still low, and the incensed club published a statement stating, "The Newcastle public do not deserve to be catered for as far as professional football is concerned". However, eventually figures picked up by 1895–96, when 14,000 fans watched the team play Bury. That season Frank Watt became secretary of the club, and he was instrumental in promotion to the First Division for the 1898–99 season. However, they lost their first game 4–2 at home to Wolverhampton Wanderers and finished their first season in thirteenth place. In 1903–04, the club built up a promising squad of players, and went on to dominate English football for almost a decade, the team known for their "artistic play, combining team-work and quick, short passing". Long after his retirement, Peter McWilliam, the team's defender at the time, said, "The Newcastle team of the 1900s would give any modern side a two goal start and beat them, and further more, beat them at a trot." Newcastle United went on to win the League on three occasions during the 1900s; 1904–05, 1906–07 and 1908–09. In 1904–05, they nearly did the double, losing to Aston Villa in the 1905 FA Cup Final. They were beaten again the following year by Everton in the 1906 FA Cup Final. They reached the final again in 1908 where they lost to Wolves. They finally won the FA Cup in 1910 when they beat Barnsley in the final. They lost again the following year in the final against Bradford City. The team returned to the FA Cup final in 1924, in the second final held at the then new Wembley Stadium. They defeated Aston Villa, winning the club's second FA Cup. Three years later they won the First Division championship a fourth time in 1926–27, with Hughie Gallacher, one of the most prolific goal scorers in the club's history, captaining the team. Other key players in this period were Neil Harris, Stan Seymour and Frank Hudspeth. In 1930, Newcastle United came close to relegation, and at the end of the season Gallacher left the club for Chelsea, and at the same time Andy Cunningham became the club's first team manager. In 1931–32, the club won the FA Cup a third time. However, a couple of years later, at the end of the 1933–34 season, the team were relegated to the Second Division after 35 seasons in the top. Cunningham left as manager and Tom Mather took over. The club found it difficult to adjust to the Second Division and were nearly further relegated in the 1937–38 season, when they were spared on goal averages. However, when World War II broke in 1939, Newcastle had a chance to regroup, and in the War period, they brought in Jackie Milburn, Tommy Walker and Bobby Cowell. They were finally promoted back to the First Division at the end of the 1947–48 season. During the 1950s, Newcastle won the FA Cup trophy on three occasions within a five-year period, beating Blackpool in 1951, Arsenal in 1952, and Manchester City in 1955. However, after this last FA Cup victory the club fell back into decline and were relegated to the Second Division once again at the end of the 1960–61 season under the management of Charlie Mitten. Mitten left after one season in the Second Division and was replaced by former player Joe Harvey. Newcastle returned to the First Division at the end of the 1964–65 season after winning the Second Division title. Under Harvey, the club qualified for European competition for the first time after a good run in the 1967–68 season and the following year won the 1969 Inter-Cities Fairs Cup Final, triumphing 6–2 over two legs against Hungary's Újpest in the final. Harvey bought striker Malcolm Macdonald in the summer of 1971, for a club record transfer fee of £180,000 (worth ₤2499065 in 2016). He was an impressive goal scorer, who led United's attack to Wembley in their 1974 FA Cup Final defeat at the hands of Liverpool. The club also had back to back triumphs in the Texaco Cup in 1974 and 1975. Harvey left the club in 1975, with Gordon Lee brought in to replace him. Lee took the team to the 1976 Football League Cup Final against Manchester City, but failed to bring the trophy back to Tyneside. However, he sold Macdonald to Arsenal at the end of the season, a decision of which Macdonald later said "I loved Newcastle, until Gordon Lee took over". Lee left for Everton in 1977, and was replaced by Richard Dinnis. United dropped once again to the Second Division at the end of the 1977–78 season. Dinnis was replaced by Bill McGarry, and then he was replaced by Arthur Cox. Cox steered Newcastle back to the First Division at the end of the 1983–84 season, with players such as Peter Beardsley, Chris Waddle and ex-England captain Kevin Keegan the fulcrum of the team. However, with a lack of funds, Cox left for Derby County and Keegan retired. With managers such as Jack Charlton and then Willie McFaul, Newcastle remained in the top-flight, until key players such as Waddle, Beardsley and Paul Gascoigne were sold, and the team was relegated once more in 1989. McFaul left the managerial post, and was replaced by Jim Smith. Smith left at the start of the 1991–92 season and the board appointed Osvaldo Ardiles his replacement. 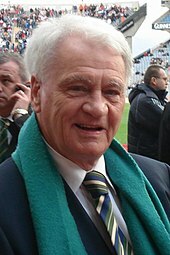 Sir John Hall became the club's chairman in 1992, and replaced Ardiles with Keegan, who managed to save the team from relegation to the Third Division. Keegan was given more money for players, and he brought in Rob Lee, Paul Bracewell and Barry Venison and the club won the then First Division Championship at the end of the 1992–93 season, earning promotion to the then new Premier League. At the end of the 1993–94 season, their first year back in the top flight they finished in third, their highest league finish since 1927. The attacking philosophy of Keegan led to the team being labelled "The Entertainers" by Sky Sports. Keegan took Newcastle to two consecutive runners-up finishes in the league in 1995–96 and 1996–97, coming very close to winning the title in the former season. This success was in part due to the talent of players like David Ginola, Les Ferdinand and Alan Shearer, who was signed on 30 July 1996 for a then world record fee of £15 million. Keegan left Newcastle in January 1997 and was replaced by Kenny Dalglish, however the club endured a largely unsuccessful season with a 13th-place finish in the 1997–98 FA Premier League, failure to progress beyond the group stages of the 1997–98 UEFA Champions League despite beating Barcelona and group winners Dynamo Kiev at St James' Park as well as coming from 2–0 down to draw 2–2 with Valery Lobanovsky's team in Ukraine and defeat in the 1998 FA Cup Final. Dalglish was replaced as manager early in the following season by Ruud Gullit. The club once again finished thirteenth in the league and lost the 1999 FA Cup Final. Gullit fell into disagreements with the squad and chairman Freddy Shepherd, and quit the club four games into the 1999–2000 season with the team bottom of the table to be replaced by Bobby Robson. The club managed to reach an FA Cup Semi-final and to stay in the Premier League. A title challenge emerged during the 2001–02 season, and Newcastle's fourth-place finish saw them qualify for the UEFA Champions League. The following season, Robson guided the team to another title challenge and finished third in the League, and the second group stage of the Champions League. Newcastle finished fifth in the league at the end of the 2003–04 season, and exited the Champions League in the qualifying rounds, but despite this Robson was sacked in August 2004 following a series of disagreements with the club. Graeme Souness was brought in to manage by the start of the 2004–05 season. In his time at the helm, he broke the club's transfer record by signing Michael Owen. Souness also took the geordies to the quarterfinals of the 2005 UEFA Cup with Alan Shearer winning the tournament's golden boot as well. However, he was sacked in February 2006 after a bad start to the club's 2005–06 season. Glenn Roeder took over, initially on a temporary basis, before being appointed full-time manager at the end of the season. Shearer retired at the end of the 2005–06 season as the club's all-time record goal scorer, with a total of 206 goals. Despite finishing the 2005–06 season in seventh, Roeder's fortunes changed in the 2006–07 season, with a terrible injury run to the senior squad, and he left the club by mutual consent on 6 May 2007. Sam Allardyce was appointed Roeder's replacement as manager on 15 May 2007. On 7 June, Freddy Shepherd's final shares in the club were sold to Mike Ashley and Shepherd was replaced as chairman by Chris Mort on 25 July. Allardyce departed the club on in January 2008 by mutual consent after a bad start to the 2007–08 season, and Kevin Keegan was reappointed as Newcastle manager. Mort stepped down as chairman in June and was replaced by Derek Llambias, a long-term associate of Ashley. 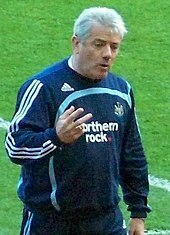 Newcastle finished the 2007–08 season in twelfth place, but as the season drew to a close, Keegan publicly criticised the board, claiming they were not providing the team enough financial support. In September 2008 Keegan resigned as manager, stating "It's my opinion that a manager must have the right to manage and that clubs should not impose upon any manager any player that he does not want". Former Wimbledon manager Joe Kinnear was appointed as his replacement, but in February 2009, due to his heart surgery, Alan Shearer was appointed interim manager in his absence. Under Shearer, the club were relegated to the Football League Championship at the end of the 2008–09 season, the first time the club had left the Premier League since joining it in 1993. Following their relegation, the club was put up for sale in June 2009, with an asking price of £100 million. Chris Hughton was given the manager job on a caretaker basis before taking over full-time on 27 October 2009. On the same day, Ashley announced that the club was no longer for sale. Hughton led Newcastle to win the 2009–10 Football League Championship, securing automatic promotion on 5 April 2010 with five games remaining, and securing the title on 19 April; Newcastle were promoted back to the Premier League after just one season away. Under Hughton, Newcastle enjoyed a strong start to the 2010–11 season, but he was sacked on 6 December 2010. The club's board stated that they felt "an individual with more managerial experience [was] needed to take the club forward." Three days later, Alan Pardew was appointed as manager with a five-and-a-half-year contract. Further controversy was caused on 31 January 2011, when striker Andy Carroll was sold to Liverpool for a club record of £35 million. Despite this turbulence, Newcastle were able to finish 12th at the end of the season, with one particular highlight being a 4–4 home draw against Arsenal that saw Newcastle come back from four goals down to claim a point. The start of the 2011–12 season saw an overhaul in the first team, with the sale of influential first team players Kevin Nolan, Joey Barton and José Enrique during the summer and the elevation of Tim Krul as first choice goalkeeper and centre back Fabricio Coloccini as captain. Signings such as Yohan Cabaye, Italian international Davide Santon and Senegalese striker Demba Ba in cut-price deals saw Newcastle adopt a new transfer policy, one which would be met with success in the season. They went on to enjoy one of their strongest openings to a season, playing 11 consecutive games unbeaten before losing away to Manchester City. Another Senegalese striker, Papiss Cissé, joined in the January transfer window, and Newcastle had a strong second half of the season, eventually securing a place in the 2012–13 Europa League. Newcastle finished in fifth place, their highest league position since the Bobby Robson days. Further honours were to come as Pardew won both the Premier League Manager of the Season and the LMA Manager of the Year awards, captain Coloccini was named in the PFA Team of the Year, and Cissé won the Goal of the Season award for a goal against Chelsea. The 2012–13 season saw Newcastle regain European football for the first time since 2007. Newcastle made few acquisitions in the summer and suffered injuries over the season, including layoffs to key midfielders Yohan Cabaye and Hatem Ben Arfa, and defenders Steven and Ryan Taylor. As a result, the first half of the season was marred by a run of ten losses in 13 games, which saw the club sink near the relegation zone. In January, Newcastle signed five French players, and advanced to the Europa League quarter-finals before bowing out to eventual finalists Benfica. Domestically, Newcastle struggled, and stayed up after a 2–1 victory over already-relegated Queens Park Rangers on the penultimate game of the season. The 2014–15 season saw Newcastle fail to win any of their first seven games, prompting fans to start a campaign to get Pardew sacked as manager before a six-game winning run in all competitions (including knocking holders Manchester City out of the League Cup) saw them climb to fifth in the table. After they ended Chelsea's unbeaten start to the season, Pardew left for Crystal Palace. On 26 January 2015, his assistant John Carver was put in charge for the remainder of the season but came close to relegation, staying up on the final day with a 2–0 home win against West Ham, with Jonás Gutiérrez, who beat testicular cancer earlier in the season, scoring the team's second goal. On 9 June 2015, Carver and his assistant Steve Stone were both sacked and replaced by Steve McClaren the following day. On 11 March 2016, McClaren was sacked after nine months as manager, with Newcastle in 19th place in the Premier League and the club having won just six of 28 Premier League games during his time at the club. He was replaced by Spaniard Rafael Benítez on the same day, who signed a three-year deal, but was not able to prevent the club from being relegated. Newcastle returned to the Premier League at the first attempt, winning the Championship title on 7 May 2017 with a 3–0 win against Barnsley. On 16 October 2017, Mike Ashley put Newcastle United up for sale. 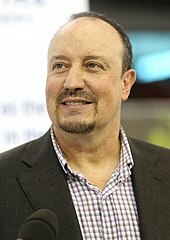 Newcastle United finished the season with a 3–0 win over the previous year's champions Chelsea, finishing 10th in the league, their highest finish in four years. The club's home colours are a black and white striped shirt. Shorts and socks are usually black with white trim, though white socks are sometimes worn under some managers who consider them "lucky". Newcastle's colours at the outset was generally the home kit of Newcastle East End F.C., comprising plain red shirts with white shorts and red socks. In 1894, the club adopted the black and white striped shirts, which had been used as the reserve team's colours. These colours were chosen for the senior team because they were not associated with either of the two teams United were merged from. They played in grey shorts until 1897, and between 1897 and 1921, they played in blue shorts before adopting the black shorts they play in now. United's away colours have changed a number of times over the years. They played in white shirts and black shorts from 1914 until 1961, and then white shorts until 1966. They then played in yellow shirts and blue shorts for the 1967–68 season, but from 1969 to 1974 played in all red with an all blue third kit. In 1974, they returned to a yellow shirt, which they played with various coloured shorts until 1983. They played in all grey from 1983 to 1988, before once again returning to the yellow kit until 1993. Since 1995, the away kit has changed consistently and has not been the same for more than a single season. Through owner Mike Ashley, the club also has a relationship with the Sports Direct retail chain which he founded. On 4 January 2012, Virgin Money, who had just bought Northern Rock, signed a two-year deal to sponsor Newcastle United. In January 2010, Puma became the official supplier and licensee of replica merchandise for Newcastle. The deal meant Puma supplied the team kit, replica kit and training equipment for the 2010–11 and 2011–12 seasons. The current club crest was first used in the 1988–89 season. The crest includes elements from the coat of arms of the city of Newcastle upon Tyne—the two sea horses representing Tyneside's strong connections with the sea, the castle representing the city's Norman keep. The city's coat of arms were first embroidered on the team's shirts in 1969 and worn as standard until 1976. A scroll at the bottom featured the city's motto in Latin; fortiter defendit triumphans which translates into English as "triumphing by brave defence." From 1976 until 1983, the club wore a specific badge which was developed to wear in place of the city's coat of arms. The design was of a circular shape, which featured the club's name in full, it contained a magpie standing in front of the River Tyne with the historic Norman castle of Newcastle in the background. A more simplistic design followed in 1983, featuring the initials of the club's name, NUFC with the small magpie used in the previous crest within the horizontally laid "C," this logo was relatively short lived and was discontinued after 1988. 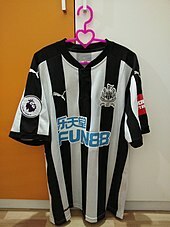 On 16 May 2013, Newcastle released the away shirt for the 2013–14 season which for the first time featured the Wonga.com logo, which attracted criticism from many Newcastle supporters; the shirt was navy blue with light blue bands. The shirt received mixed reviews from Newcastle supporters, who described the shirt as both "awesome" and "bland", as quoted in the Newcastle daily Evening Chronicle. In July 2013, Newcastle striker and practising Muslim Papiss Cissé refused to wear any official kit or training wear with reference to Wonga.com, subsequently failing to travel to the team's 2013 pre-season tour of Portugal. The matter has since been resolved. On 15 May 2017, the home shirt for the 2017–18 season was revealed, featuring the logo of new sponsors Fun88. The shirt was shown to include a gold and silver commemorative crest to mark the club's 125th football season, based on the city's coat of arms. It was also announced that the kit would feature red numbers for the first time since the 1992–93 season. Previous kit sponsors include Newcastle Breweries (1980–86), Greenall's Beers (1986–90), McEwan's Lager and Newcastle Brown Ale (1990–2000), NTL (2000–03), Northern Rock (2003–12), and Virgin Money (2012–13). Newcastle's current kit manufacturers are Puma, in a deal that started in 2010. Previous kit manufacturers include Bukta (1974–75, 1976–80), Umbro (1975–76, 1980–86), Asics (1993–95) and Adidas (1995–2010). Other current team sponsors include Fun88, Carling, Coral, Pulman, Thomas Cook Group and Stelrad. Newcastle United have named Indian tyre conglomerate Madras Rubber Factory Limited – more commonly known as MRF – as the club's new shirt sleeve sponsor for the 2017/18 Premier League season. Newcastle finished as the Football League's best supported club on ten occasions. NUFC were the first club in the world to attract over one million for league games (1946–47) and average over 50,000 for league games (1947–48; 56,283). Throughout Newcastle United's history, their home venue has been St James' Park, the oldest and largest football stadium in North East England, as well as the sixth-largest football stadium in the United Kingdom. It has hosted ten international football matches at senior level, the first in 1901 and the most recent in 2005. It was used as a venue for both the 2012 Summer Olympics and the 2015 Rugby World Cup. Football had been played at St James' Park as early as 1880, the ground being occupied by Newcastle Rangers, before becoming the home of Newcastle West End F.C. in 1886. Its lease was then bought by Newcastle East End F.C. in 1892, before they changed their name to Newcastle United. At the turn of the 19th century, the ground's capacity was given as 30,000 before being redeveloped between 1900 and 1905, increasing the capacity to 60,000 and making it the biggest stadium in England for a time. For most of the 20th century, the stadium changed very little, despite various plans for development of the ground. The old West Stand was replaced with the Milburn Stand in 1987, the Sir John Hall Stand replacing the Leazes End in 1993, and the rest of the ground renovated making the ground a 37,000 capacity all-seater stadium. Between 1998 and 2000, double tiers were added to the Milburn and John Hall stands to bring the venue up to its current capacity of 52,354. There were plans to build a new 90,000 seater stadium in Leazes park, just behind St James' with Newcastle Falcons taking over St James' Park, but due to protests the plans were dropped. St James' Park currently seats 52,354 people, but club owner Mike Ashley would consider taking the roof off The Gallowgate end and adding another 6,000 seats making the total capacity to 58,420, but only if the team manage to finish in the top six places of the Premier League. In October 2009, Mike Ashley announced that he planned to lease the name of the ground in a bid to increase revenue, and in November the stadium was temporarily renamed sportsdirect.com @ St James' Park Stadium. This name was only supposed to be used until the end of the 2009–10 season, but lasted until November 2011. On 10 November 2011, the club officially changed the name of the stadium to the Sports Direct Arena, although this will most likely be an interim name, as it is only being used to showcase the sponsorship capabilities of the stadium. The company, owned by Ashley, were not paying anything for the deal. However, if another company purchases the naming rights, they will be expected to pay between £8 million and £10 million. Many fans voiced their anger at the renaming, but managing director Derek Llambias has said that it was necessary to give Newcastle extra money so that they compete with the bigger clubs in the league. Since 1982, the stadium is served by St James Metro station on the Tyne and Wear Metro. The station is decorated in a black and white colour scheme, with archive photographs of the club's players. The club's current training ground is located at Darsley Park, which is north of the city at Benton. The facility was opened in July 2003 and is also used by the Newcastle Falcons rugby team. Newcastle United was set up as a private company limited by shares on 6 September 1895. The club traded in this way for much of the 20th century, dominated by McKeag, Westwood and Seymour family ownership, until April 1997, when John Hall, who bought 72.9% of the club for £3 million in 1991, floated the club on the stock exchange as a public limited company, with less than half the shares sold to the Hall family and the majority holding going to his business partner Freddy Shepherd. Later that year, Hall stepped down as chairman and was replaced by Shepherd, with the Hall family represented on the board by John's son Douglas. In December 1998, after buying a 6.3% stake in the club for £10 million, the media group NTL had considered a full takeover of the club. This was later dropped after the Competition Commission, established in April 1999, expressed concerns about football clubs being owned by media companies. In 2007, businessman Mike Ashley purchased the combined stakes of both Douglas and John Hall, 41% share in the club, through a holding company St James Holdings, with a view to buy the rest. Upon purchasing this share, he appointed Chris Mort as chairman, while gaining more shares, owning 93.19% of the club by 29 June 2007. This figure reached 95% on 11 July 2007, forcing the remaining shareholders to sell their shares. Since completing the purchase of the club, Ashley has announced that he planned to sell the club on three different occasions. The first occurred after fan protests over the resignation of Kevin Keegan on 14 September 2008, when Ashley stated, "I have listened to you. You want me out. That is what I am now trying to do." However, he took it off the market on 28 December 2008 after being unable to find a buyer. On 31 May 2009, it was reported that Ashley was attempting to sell the club again. On 8 June 2009, Ashley confirmed that the club was up for sale at an asking price of £100 million. By the end of August 2009, the club was back off the market. On 16 October 2017, Newcastle United announced that Ashley had once again put the club up for sale, reporting that he hoped that a deal could be concluded by Christmas 2017. Newcastle United established the Newcastle United Foundation in summer 2008, which seeks to encourage learning and promote healthy living amongst disadvantaged children, young people and families in the North East region, as well as promoting equality and diversity. The Foundation's manager Kate Bradley told charity news website The Third Sector, "Children look up to players as their heroes, and anything they say is instantly taken on board. If Newcastle defender Steven Taylor tells them not to eat a Mars bar for breakfast, they'll listen." In 2010, the charity taught over 5,000 children about healthy living. The Foundation's commitment, along with a similar foundation run by West Bromwich Albion, the unique relationship that Aston Villa has with Acorns Children's Hospice and Tottenham Hotspur has with SOS Children's Villages UK, are some leading examples of commitment in the highest level of football to responsibility and change in the communities in which they work and who enrich them through their support and ticket sales. The work of these clubs, and others, is changing the way professional sport interacts with their communities and supporters. In December 2012, the club announced that it had become the world's first carbon positive football club. Supporters of Newcastle United are drawn from all over the North East and beyond, with supporters' clubs in some countries across the world. The club's nickname is 'The Magpies', while the club's supporters are also known as the Geordies or the Toon Army. The name Toon originates from the Geordie pronunciation of town. In a 2004 survey by Co-operative Financial Services, it was found that Newcastle United topped the league table for the cost incurred and distance travelled by Newcastle-based fans wishing to travel to every Premier League away game. The total distance travelled for a fan to attend every away game from Newcastle was found to be equivalent to a round-the-world trip. In the 2009–10 season, when the club were playing in English football's second tier, the Football League Championship, the average attendance at St James' Park was 43,388, the fourth-highest for an English club that season. At the end of the 2011–12 Premier league season, Newcastle United held the third-highest average attendance for the season, at 49,935. This figure was only surpassed by Arsenal and Manchester United, the only two clubs in the Premier League with larger stadiums at the time. The club's supporters publish a number of fanzines including True Faith and The Mag, along with NUFC.com, which was established in 1996. They set up Newcastle United Supporters Trust in September 2008, aiming to "represent the broad church of Newcastle United's support." In addition to the usual English football chants, Newcastle's supporters sing the traditional Tyneside song "Blaydon Races." Prior to each home game the team enters the field to "Local Hero", written by Newcastle native Mark Knopfler, founder of Dire Straits. Traditionally, Newcastle's main rivals are Sunderland, against whom the Tyne–Wear derby is competed. As of the 2018–19 season, Newcastle United have spent 87 seasons in the top-flight. They are eighth in the all-time Premier League table and have the ninth-highest total of major honours won by an English club with 11 wins. The holder of the record for the most appearances is Jimmy Lawrence, having made 496 first team appearances between 1904 and 1921. The club's top goal scorer is Alan Shearer, who scored 206 goals in all competitions between 1996 and 2006. Andy Cole holds the record for the most goals scored in a season: 41 in the 1993–94 season in the Premier League. Shay Given is the most capped international for the club, with 134 appearances for Republic of Ireland. The club's widest victory margin in the league was in the 13–0 win against Newport County in the Second Division in 1946. Their heaviest defeat in the league was 9–0 against Burton Wanderers in the Second Division in 1895. The club's longest number of consecutive seasons in the top flight of English football was 36 from 1898–99 until 1933–34. Newcastle's record home attendance is 68,386 for a First Division match against Chelsea on 3 September 1930. The club's highest attendance in the Premier League is 52,389, in a match against Manchester City on 6 May 2012. Newcastle lost the game 2–0. The highest transfer fee received for a Newcastle player is £35 million, from Liverpool for Andy Carroll in January 2011, while the most spent by the club on a player was £21 million, for Miguel Almirón from Atlanta United in January 2019. ^ a b c The player is classified as an Under-21 player, and not included in Newcastle United's 25-man squad. ^ "Premier League Handbook – Season 2010/11". Premier League. Archived from the original on 13 November 2011. Retrieved 7 May 2011. ^ Brus, Mark (2 March 2015). "England's Ten Most Successful Clubs: Chelsea Still Way Behind Arsenal, Liverpool & Man United Despite Capital One Cup Win". ^ a b c d e f g h P. Joannou. "The Formation of Newcastle United". www.nufc.co.uk. Archived from the original on 20 March 2011. Retrieved 3 April 2011. ^ a b c d e f g h i j k l m n o p q r Nu Mad (18 February 2007). "Newcastle Utd – The History". www.newcastleunited-mad.co.uk. Retrieved 3 April 2011. ^ Turnbull, Simon (16 May 1999). "Football: Only one United? Why we are united in our disgust". The Independent. Archived from the original on 18 January 2008. Retrieved 8 January 2007. ^ "Newcastle United, "Newcastle United Trophy cabinet which has been empty for many a year."". Sky Sports. Archived from the original on 24 October 2007. Retrieved 18 January 2007. ^ "Malcolm Macdonald: His Playing Style". www.supermac.co.uk. 4 May 2010. Retrieved 10 May 2011. ^ "English Texaco Cup : Honours". statto.com. Archived from the original on 19 May 2012. Retrieved 10 April 2011. ^ Scott Murray, Barney Ronay and Andy Bull (5 February 2010). "The Joy of Six: Neutrals' favourites". The Guardian. UK. Retrieved 11 April 2011. ^ "Gullit named Newcastle boss". BBC Sport. 27 August 1998. Retrieved 11 April 2011. ^ a b Joannou, P. "The Modern Era at Newcastle United: 1980–2000". nufc.co.uk. Archived from the original on 5 December 2010. Retrieved 11 April 2011. ^ "Robson takes Newcastle hotseat". BBC Sport. 3 September 1999. Retrieved 11 April 2011. ^ Joannou, P. "Robson Comes Home". nufc.co.uk. Archived from the original on 19 February 2013. Retrieved 11 April 2011. ^ "Premier League History – Season 2003/04". Premier League. Archived from the original on 30 August 2011. Retrieved 11 April 2011. ^ "Newcastle force Robson out". BBC Sport. 30 August 2004. Retrieved 11 April 2011. ^ "Shearer lifts determined Newcastle". UEFA.com. ^ "Sporting stage dramatic comeback". UEFA.com. ^ "Statistics Goals scored Seasons 2004/05". UEFA.com. ^ Bevan, Chris (2 February 2006). "What went wrong for Souness?". BBC Sport. Retrieved 12 April 2011. ^ "Roeder named as Newcastle manager". BBC Sport. 16 May 2006. Retrieved 12 April 2011. ^ "Roeder resigns as Newcastle boss". BBC Sport. 6 May 2007. Retrieved 12 April 2011. ^ "Newcastle name Allardyce as boss". BBC Sport. 15 May 2007. Retrieved 12 April 2011. ^ "Ashley to take over Newcastle Utd". BBC. 7 June 2007. Retrieved 12 April 2011. ^ "Mort in for Shepherd at Newcastle". BBC Sport. 25 July 2007. Retrieved 12 April 2011. ^ "Allardyce reign ends at Newcastle". BBC Sport. 9 January 2008. Retrieved 12 April 2011. ^ "Keegan returns as Newcastle boss". BBC Sport. 16 January 2008. Retrieved 12 April 2011. ^ "Chris Mort quits as Newcastle chairman, Derek Llambias named managing director". The Daily Telegraph. London. 17 June 2008. Retrieved 30 July 2008. ^ "I've no idea how much I can spend in the summer but it won't be enough to challenge top four, reveals Newcastle boss Keegan". Daily Mail. London. 6 May 2008. ^ "Keegan resigns as Newcastle boss". BBC Sport. 4 September 2008. Retrieved 12 April 2011. ^ Roopanarine, Les (26 September 2008). "Newcastle appoint Kinnear as interim manager". The Guardian. UK. Retrieved 12 April 2011. ^ "Kinnear 'will resume Magpies job'". BBC Sport. 2 April 2009. Retrieved 12 April 2011. ^ James, Stuart (24 May 2009). "Alan Shearer demands Newcastle overhaul following relegation". The Guardian. UK. Retrieved 12 April 2011. ^ Benammar, Emily (9 June 2009). "Newcastle up for sale: email your offers now". Daily Telegraph. London. Retrieved 12 April 2011. ^ "Newcastle confirm Hughton as boss". BBC Sport. 27 October 2009. Retrieved 12 April 2011. ^ a b "Ashley takes Newcastle off market". BBC Sport. 27 October 2011. Retrieved 12 April 2011. ^ "Newcastle United secure promotion to Premier League". BBC Sport. 6 April 2010. Retrieved 7 April 2010. ^ Alexander, Steve (5 April 2010). "Newcastle United Promoted Back to the Premier League". goal.com. ^ "Plymouth 0–2 Newcastle". BBC Sport. 19 April 2010. Retrieved 20 May 2010. ^ Gibbs, Thom (6 December 2010). "Chris Hughton sacked as manager of Newcastle United". The Daily Telegraph. London. Retrieved 6 December 2010. ^ Pengelly, Martin (6 December 2010). "Peter Beardsley named as Newcastle United caretaker manager". The Guardian. London. Retrieved 25 January 2011. ^ "Alan Pardew signs lengthy deal as new Newcastle manager". BBC Sport. 9 December 2010. Retrieved 25 January 2011. ^ a b "Carroll joins Liverpool". The Premier League. Archived from the original on 2 February 2011. Retrieved 1 February 2011. ^ "Newcastle 4–4 Arsenal". BBC Sport. 5 February 2011. Retrieved 31 July 2012. ^ "West Ham United sign Kevin Nolan from Newcastle United". BBC Sport. Retrieved 1 October 2014. ^ "Joey Barton joins QPR from Newcastle United". BBC Sport. Retrieved 1 October 2014. ^ "Jose Enrique joins Liverpool from Newcastle". BBC Sport. Retrieved 1 October 2014. ^ "Newcastle sign Lille midfielder Yohan Cabaye". BBC Sport. 10 June 2011. ^ "Inter Milan defender Davide Santon joins Newcastle". BBC Sport. 30 August 2011. ^ "Newcastle make striker Demba Ba capture from West Ham". BBC Sport. 17 June 2011. ^ "Newcastle 2–1 Everton". BBC Sport. Retrieved 1 October 2014. ^ "Manchester City 3–1 Newcastle". BBC Sport. 19 November 2011. ^ "Newcastle 3–0 Stoke". BBC Sport. 21 April 2012. ^ "Alan Pardew and Vincent Kompany's Premier League award". BBC Sport. 11 May 2012. ^ "Moussa Sissoko joins Newcastle United from Toulouse". BBC Sport. Retrieved 1 October 2014. ^ Young, Colin (3 January 2013). "Mathieu Debuchy completes a £5.5m Newcastle Move". Daily Mail. London. Retrieved 3 January 2013. ^ "Newcastle sign Yoan Gouffran from French outfit Bordeaux". BBC Sport. Retrieved 1 October 2014. ^ "Mapou Yanga-Mbiwa joins Newcastle United from Montpellier". BBC Sport. Retrieved 1 October 2014. ^ Chris McKenna. "BBC Sport – Newcastle 1–1 Benfica (agg 2–4)". BBC Sport. Retrieved 1 October 2014. ^ "QPR 1–2 Newcastle". BBC Sport. 12 May 2013. ^ "Southampton 4 Newcastle 0: Pressure mounts on Pardew after another unhappy return to St Mary's". London Evening Standard. Retrieved 13 August 2015. ^ "Manchester City 0–2 Newcastle United". BBC Sport. Retrieved 13 August 2015. ^ "Newcastle United 2–1 Chelsea". BBC Sport. Retrieved 13 August 2015. ^ "Alan Pardew: Crystal Palace confirm manager's appointment". BBC Sport. Retrieved 13 August 2015. ^ "Newcastle United 2–0 West Ham United". BBC Sport. Retrieved 13 August 2015. ^ "John Carver: Newcastle caretaker manager leaves with Steve Stone". BBC Sport. Retrieved 13 August 2015. ^ "Steve McClaren: Newcastle appoint ex-England manager". BBC Sport. Retrieved 13 August 2015. ^ a b "Rafael Benitez: Newcastle United appoint Spaniard as Steve McClaren's successor". bbc.co.uk. Retrieved 11 March 2016. ^ Taylor, Daniel (11 May 2016). "Sunderland safe after Lamine Koné double sinks crumbling Everton". The Guardian. Retrieved 12 May 2016. ^ "Newcastle United clinched the Championship title with victory over Barnsley, after Brighton conceded a late equaliser at Aston Villa". BBC Sport. 7 May 2017. Retrieved 7 May 2017. ^ "Newcastle United: Mike Ashley puts Premier League club up for sale". ^ "Newcastle United 3–0 Chelsea". BBC Sport. 13 May 2018. Retrieved 6 July 2018. ^ "Premier League (Sky Sports)". SkySports. Retrieved 6 July 2018. ^ "Newcastle United 07/08 adidas away & GK football kits". FootballShirtCulture.com. Archived from the original on 8 November 2007. Retrieved 10 January 2007. ^ a b "Newcastle United". HistoricalKits.co.uk. Retrieved 8 January 2007. ^ "Newcastle United". KitClassics.co.uk. Archived from the original on 6 January 2007. Retrieved 8 January 2007. ^ "Change Kits". www.historicalkits.co.uk. Retrieved 11 April 2011. ^ Finch, Julia (28 February 2007). "Flotation makes Sports Direct founder a billionaire". The Guardian. London. Retrieved 21 July 2009. ^ "Virgin Money to sponsor Newcastle United Football Club". Virgin Money. 4 January 2012. Retrieved 4 January 2012. ^ "Newcastle United Announce Puma Kit Deal". footballshirtculture.com. 19 January 2010. Retrieved 14 April 2011. ^ "Club Crest". nufc.co.uk. Retrieved 12 April 2011. ^ "The Coat of Arms of the City of Newcastle upon Tyne". www.newcastle.gov.uk. Retrieved 12 April 2011. ^ a b "Newcastle United". WeltFussballArchiv.com. Retrieved 10 January 2008. ^ "Fans give their verdict on Newcastle United's new away kit". Newcastle Evening Chronicle. 4 January 2012. Retrieved 4 January 2012. ^ Graeme Yorke (8 June 2013). "Papiss Cisse will refuse to wear Newcastle shirt with Wonga sponsorship". Daily Mail. London. Retrieved 4 February 2014. ^ Smith, Ben (25 July 2013). "Papiss Cisse and Newcastle resolve shirt sponsor dispute". BBC Sport. Retrieved 4 February 2014. ^ "Newcastle United - New kit: A closer look". nufc.co.uk. 14 June 2017. Retrieved 21 October 2018. ^ "Club partners". NUFC.co.uk. Archived from the original on 20 March 2017. Retrieved 20 March 2017. ^ "A shirty Christmas with Bukta". Football Shirt Culture.com. ^ "Kit History". Historical Kits.co.uk. ^ a b "sports direct arena". Archived from the original (PHP) on 13 July 2011. Retrieved 13 April 2011. ^ "England's Matches 1900–1914". englandfootballonline.com. Retrieved 13 April 2011. ^ "England 2 Azerbaijan 0". englandfootballonline.com. Retrieved 13 April 2011. ^ White, Andrew (28 July 2009). "Newcastle's St James' Park to be Rugby World Cup venue". The Northern Echo. Retrieved 13 April 2011. ^ "The Sports Direct Arena Story". nufc.co.uk. Archived from the original on 13 November 2011. Retrieved 13 April 2011. ^ a b "Newcastle reveal new stadium name". London: BBC Sport. 4 November 2009. Retrieved 4 November 2009. ^ Bird, Simon (29 March 2011). "Newcastle 'have cost Ashley £285.8m so far'". Daily Mirror. UK. Retrieved 13 April 2011. ^ Edwards, Luke (10 November 2011). "Newcastle United insist Sports Direct Arena name change is essential to help pay for new striker". The Daily Telegraph. London. Retrieved 16 November 2011. ^ "Magpies – We need the money". Sky Sports News. 10 November 2011. Retrieved 16 November 2011. ^ Beasley, Rob (10 November 2011). "Welcome to Sports Direct Arena". London: The Sun. Retrieved 16 November 2011. ^ "St. James". thetrams.co.uk. Retrieved 10 May 2011. ^ "Ground News". nufc.com. 24 June 2009. Retrieved 13 April 2011. ^ Cassidy, Denis (2012). Newcastle United: The Day the Promises Had to Stop. Amberley Publishing. ISBN 978-1445609034. ^ Conn, David (8 February 2006). "How the Geordie Nation turned into a cash cow". The Guardian. UK. Retrieved 13 April 2011. ^ "Newcastle United". ukbusinesspark.co.uk. Archived from the original on 22 February 2008. Retrieved 5 August 2008. ^ Ubha, Ravi (23 May 2007). "Ashley, Retail Billionaire, Offers to Buy Newcastle". Bloomberg. Archived from the original on 5 November 2012. Retrieved 13 April 2011. ^ "Ashley tightens grip on Magpies". The Guardian. UK. 29 June 2007. Retrieved 13 April 2011. ^ "Ashley poised to complete Newcastle buy-out". The Times. UK. 11 July 2007. Retrieved 13 April 2011. ^ "Ashley puts Newcastle up for sale". BBC Sport. 14 September 2008. Retrieved 13 April 2011. ^ "Ashley calls off Newcastle sale". BBC Sport. 28 December 2008. Retrieved 28 December 2008. ^ "Ashley wants quick Newcastle sale". London: BBC Sport. 31 May 2009. Retrieved 1 June 2009. ^ "Mike Ashley puts Newcastle United up for sale again". Evening Chronicle. 1 June 2009. Archived from the original on 5 June 2009. Retrieved 1 June 2009. ^ Caulkin, George (8 June 2009). "Mike Ashley brings more embarrassment on Newcastle". The Times. UK. Retrieved 14 April 2011. ^ Richardson, Andy (24 August 2009). "Is Ashley ready to make a definitive decision?". The Northern Echo. Retrieved 14 April 2011. ^ "Newcastle United: Mike Ashley puts Premier League club up for sale". BBC Sport. 16 October 2017. Retrieved 16 October 2017. ^ a b Moore, James (18 February 2011). "Newcastle United Foundation hails success". Evening Chronicle. Retrieved 14 April 2011. ^ "Foundation". nufc.co.uk. Archived from the original on 8 April 2011. Retrieved 14 April 2011. ^ "How much do Premier League football clubs give to charity?". thirdsector.co.uk. 16 August 2010. Archived from the original on 15 June 2013. Retrieved 14 April 2011. ^ Parthasarathi, Shyam (3 June 2008). "English Premier League: Aston Villa Unveil Charity Sponsorship Deal". bleacherreport.com. Retrieved 14 April 2011. ^ "Soccer Players and Charity Works". cultureofsoccer.com. 29 December 2006. Retrieved 14 April 2011. ^ "fcbusiness Magazine – Newcastle United Becomes World's First 'Carbon Positive' Football Club". 5 December 2012. Archived from the original on 20 April 2013. Retrieved 5 December 2012. ^ "Newcastle Supporters Club Sites". thefootballnetwork.net. Retrieved 14 April 2011. ^ "Geordie Dictionary". englandsnortheast.co.uk. Retrieved 14 April 2011. ^ Szczepanik, Nick (26 September 2007). "Newcastle top of the league when it comes to dedication of fans". The Times. London. Retrieved 28 September 2007. ^ "Football Fans Pay the Price of Away Support". PR Newswire. 23 November 2004. Retrieved 14 April 2011. ^ Harrison, Ed (17 May 2010). "Newcastle's Home Attendance 4th Best in England". nufcblog.com. Retrieved 14 April 2011. ^ a b "English Premier League Team Attendance Statistics – 2011–12 – ESPN FC". Soccernet.espn.go.com. 13 May 2012. Retrieved 4 February 2014. ^ Ryder, Lee (15 September 2008). "New supporters club to give fans a voice". Evening Chronicle. Retrieved 14 April 2011. ^ "Blaydon Races". terracechants.me.uk. Retrieved 14 April 2011. ^ "Listen to Comin' Home Newcastle football chant". fanchants.com. Retrieved 14 April 2011. ^ Young, Colin (14 April 2013). "Back to the dark ages: Geordies run amok after drug-fuelled Millwall battle". Mail Online. Retrieved 10 December 2015. ^ "Football : Running Total of Trophies". Kryss Tal. Retrieved 2 April 2011. ^ a b c d e "Club Records". nufc.co.uk. Retrieved 15 April 2011. 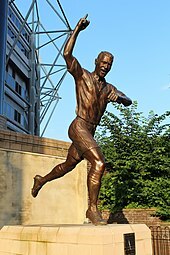 ^ "Player profiles: Alan Shearer". Racing Post. Archived from the original on 22 January 2009. Retrieved 8 July 2007. ^ Ben Smith (6 May 2012). "Newcastle 0 – 2 Man City". BBC Sport. ^ Taylor, Louise (31 January 2019). "Newcastle break club record to sign £21m Miguel Almirón from Atlanta". The Guardian. Retrieved 1 February 2019. ^ a b c "Honours and Records". NUFC.co.uk. ^ "First Team". Newcastle United. Retrieved 4 September 2018. ^ "United confirm 2018/19 squad numbers confirmed" (Press release). Newcastle United F.C. 10 August 2018. Retrieved 4 September 2018. ^ "Updated squad lists for 2018/19 Premier League" (Press release). Premier League. 1 February 2018. Retrieved 1 February 2019. ^ "2018/19 Premier League squad numbers" (Press release). Premier League. 4 September 2018. Retrieved 6 September 2018. ^ "Newcastle United squad numbers revealed for the 2018-19 Premier League season". Chronicle Live. 1 February 2019. Retrieved 2 February 2019. Wikimedia Commons has media related to Newcastle United FC.